For Immediate Release – June 08, 2018 – Oklahoma City, Oklahoma – Founded in 1980, the National Reining Horse Association (NRHA) Derby features 4-, 5- and 6-year-old horses competing for the prestigious titles of Open and Non Pro NRHA Derby Champions. Held in the late spring/early summer each year in Oklahoma City, the NRHA Derby is the richest added money Derby in North America. With its tradition and deep competition, the NRHA Derby is a top reining event each year. 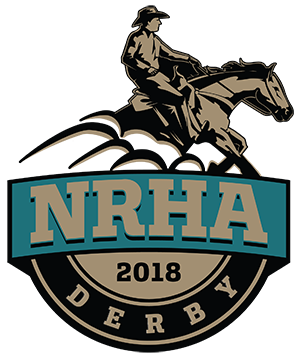 In its 38th year, the 2018 NRHA Derby features an estimated $850,000 in added purse monies and is shaping up to be the largest ever. With the potential to grow until the show’s start, the event has already reached a record number of overall entries—topping the record-setting 2017 NRHA Derby. Non Pro Derby entries are also at an all-time high, solidifying the event as the premeir reining show of the summer! There is still time to be a part of this historic event! Entry forms can be found at nrhaderby.com/forms. Entries made before June 14, 2018 will only need to pay a $200 late fee. Entries received from June 15 to one day prior to the start of the show will pay a $500 late fee. For questions, contact the NRHA office at 405-946-7400 or events@nrha.com. Visit nrhaderby.com to find hotel information, event forms, a map of the State Fair Park and the schedule. NRHA would like to thank the following corporate partners and event sponsors for their support! Adequan, Anderson Bean, Bluebonnet Feeds, Cardinal Reining Horses, CINCH, Classic Equine, John Deere, Kiser Arena Specialists, Lucas Oil, Markel Insurance, Montana Silversmiths, MS Diamonds TX, Oklahoma City Convention & Visitors Bureau, Platinum Performance, Protect the Harvest, Quarter Horse News, Santa Hill Ranch, Shorty’s Caboy Hattery, Silver Spurs Equine, Silver Spurs Saddles, SmartPak, Story Book Stables, Sandbur Productions, Tamarack Ranch, US Rider, World Wide Slide & Tom McCutcheon Virtual Horse Help.